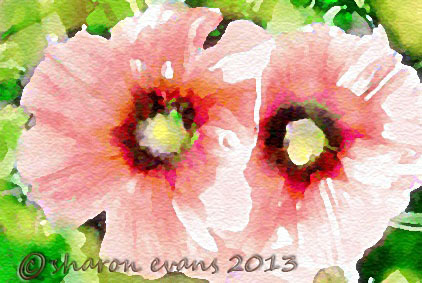 For my entry for Diana Evan's 10Minute Warn Up today I have a watercolour of a hollyhock from my garden. I thought that they had died, but with the recent rain they have spurted back into life. As it is still hot everything has gone crazy, you would think it was spring instead of autumn. This picture today is much more successful than yesterday’s, as I haven’t overworked it! Although I think I went a bit overboard on the magenta in the flower centers, on the other hand it might be what brings the picture into life!. I timed myself today too! 12 concentrated minutes and 5 minutes later on when paint dried, to add a touch here and there, so 17 minutes. Mind you they are small, above is the actual size, nowhere to hide, lol!! you are on a roll here Sharon, wonderful work for 12 minutes.